The sun was shining Easter morning of 1987. As a 10 year old, I faked my way through being surprised by where that darn Easter Bunny had hidden the same cracked plastic eggs for my sibling’s sake. When it was over, my parents sat my brother and I down and told us there was something else they’d like to give us. They presented us with 2 objects that would change our lives: matching, tan, Rawlings baseball gloves brandishing the bold “The Finest in the field” statement. Rawlings was the glove we saw our favourite Toronto Blue Jays using, and now it was right there… in our living room. Putting the mitt on my left hand was a spiritual experience. It made my spirit leap and breathed hope into my major league dreams. I became a Blue Jays fan in the fall of 1985 as George Bell dropped to his knees celebrating their first ever pennant. In ’86, Jesse Barfield took the majors by storm, not only by hitting 40 home runs, but by his cannon-arm reaching its pinnacle. I began examining my brand new highly-treasured object. I saw HIS name on MY glove. The man who made diving catches then threw out those damn fools who dared to take an extra base… Jesse Barfield. George Bell would hit 47 home runs that season and become my favourite player. But Jesse’s name was forever on my weapon. We played baseball daily. We played it as soon as the sun came up, before the heat of the day in our schoolyard tennis court. We played it in backyards. We played Brantford Minor Baseball too. We played it in the sun and we played it in the rain. My parents would holler at us about getting our leather wet, but it was no use. There were so many benefits of the rain! It worked it in better, it made our hands smell like leather so we could continue smelling like the game we loved later, and hey… why stop playing baseball just because of a little water. The ball was just a bit heavier. Today, the insides are torn and worn from those rain games but it still fits like a glove. In 1991, I took a baseball road trip to watch the Blue Jays at Baltimore’s Memorial Stadium with my good friend. We followed the Jays around malls and tracked them down in hotels to get autographs on our home white hats. We waved those hats around tauntingly, much to the chagrin of the O’s fans whose team was HORRID in the long summer of ’91 before they moved to Camden Yards the next year. My hat was ink-loaded, but I held out my glove autograph for one man. Kelly Gruber. I was playing 3rd base that year and I loved how that chiseled Texan attacked balls, springing to life like a fox terrier and launching the sphere to John Olerud as if it was shot from a bazooka. After game 2 of 3, we waited outside of the visitor’s gate until we saw his blond locks dancing out of the tunnel. He said nothing, barely looking at us on his way to the waiting bus, but he DID sign my glove. That season, I looked down at his name before every pitch. It reminded me to get down low in my crouch and have my glove touching the dirt. The felt blue marker is still VERY faintly visible to the eye, but I don’t have to SEE it to know what it looks like. In 2000, as a young married man, I traveled to Ghana with visions of becoming to West African Baseball what Cool Runnings was to Jamaican Bobsledding. I had the amazing opportunity to combine sharing God’s love for mankind with being a part of the National spark of what is now an active Ghanaian baseball program. During one of my rural baseball exhibitions, my then 13-year- old glove’s leather laces broke for the first time. No other glove would do for me, so I asked some of the ex-professional Japanese ballplayers that were being paid handsomely to coach baseball in the wealthier Accra schools what to do. One, who was a friend of Hideo Nomo (who had become the first Japanese player to reach the major leagues 5 years prior) took my glove and me off to the busy market and bought some local leather. He cut it into small strips, and fixed my worn Rawlings up. It wasn’t perfect surgery, but each time I pull the African leather additions tight, I remember the purpose and passion of my equatorial adventures. My baseball glove is now 25 years old. I can’t wait to play catch with my son this spring, using the only glove I’ve called mine in a quarter century. It hangs in my den near my desk. When I need to escape from the world for a minute, I’ll put it over my face, lay on the couch and inhale its history. Many storied materials were reported as industrial chemistry was developed in the 1800s. In the early 1900s, Bakelite, the first fully synthetic thermoset was reported by Belgian chemist Leo Baekeland. Mine says "Tony Fernandez." Even though I was never very good as a shortstop (my skills were better used in right field), I always admired his attitude on the field. 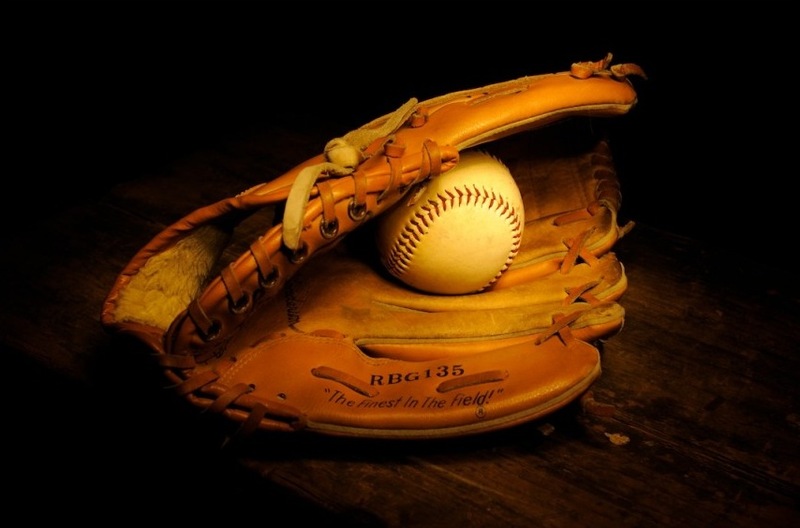 Baseball gloves hold a visceral history. Mine brings back recollections of my dad's glove. Wanting one just like his. Playing catch in the backyard. Learning to throw, hit, and field. Playing baseball (badly) but loving it. My glove has been put away, but I think it's time to pull it out of storage and take a deep breath or two.